The last king of Wuyue during the Ten Kingdoms imperial interregnum was a devout Buddhist. 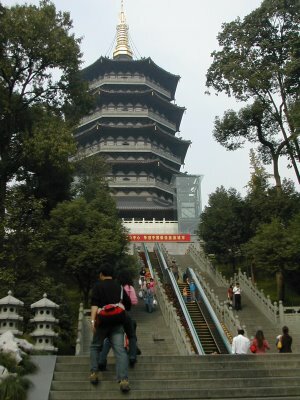 One of his many religious construction projects was a towering pagoda on Leifeng, "Thunder Top", built to house a lock of Sakyamuni's hair. Completed in the AD 970s, the structure on the southern shore of the West Lake was refurbished and rebuilt repeatedly through the centuries until Japanese pirates torched it in the 18th century and it was abandoned. The tower's brick core still stood as a prominent landmark, sprouting small trees, a favourite haunt of tourists and lovers of romantic ruins, until it collapsed in the 1920s. Treasure hunters were most likely to blame for that final indignity. The site still retained its fame, being associated with the story of Lady White Snake, and even Mao made an official visit to the ruin mound of the pious old king. Times changed, and in 1999 the burghers of Hangzhou decided to rebuild the pagoda as part of their investments in West Lake tourism. 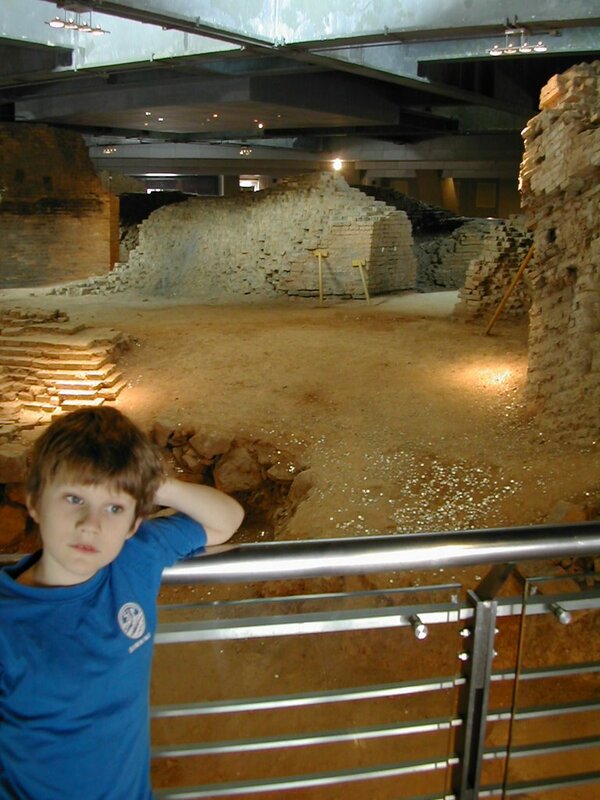 Archaeologists were called in to excavate, and the structure's various incarnations were identified all the way back to the 10th century crypt where the lock of hair had been housed. A considerable amount of fine votive metalwork was also unearthed, some of it having been antique already when deposited, indicating that the looters had good reason to target this particular site. Until recently, Chinese reconstructions of ancient buildings have been pretty brutal, often obliterating the remains of the original structures. The philosophy seems to have been "we want to show the tourists something we can be proud of, not just crappy old ruins". The tourist-friendly parts of the Great Wall, where not a single original stone can be seen, are a case in point. But recently, a more respectful attitude has been adopted. In 2002 a magnificent new octagonal five-story pagoda was inaugurated on Thunder Top, yet again dominating the West Lake's southern skyline. But the new structure stands on steel stilts with the remains of its predecessors preserved and displayed in situ in the basement. Visitors toss droves of coins onto the old brick walls. I wonder if many of them do so out of piety. Buddhist cult with incense-burning and praying is encouraged outside a building at the foot of the hill housing a silver reliquary found by the archaeologists. It's the first time I've seen an archaeological find becoming the object of religious worship, as opposed to religious relics housed above ground attracting the interest of archaeologists. The new pagoda looks great from afar. Close-up, it's pretty tacky like all modern Chinese re-imaginations of the past, unabashedly made of modern materials, its faux-copper columns painted with metallic plastic. It's basically a fancy lookout tower for tourists with display cases full of neo-classical Chinese artwork. But each age has of course rebuilt the thing for its own purposes and with the materials available. One day the 2002 version of Leifeng pagoda will also be excavated by curious posterity. I'm loving your travel reports. It sounds like you're seeing a lot of things that most tourists probably wouldn't. I've always thought the best way to see a country was with someone who could show you around. My brother and sister in law had a wonderful time in Thailand when they got married there a few years ago. My sister in law's mother is Thai and she and her family took them to smaller villages and sites that they wouldn't have seen otherwise. They also got to take part in the annual "water festival" (not sure the name of the festival) in April in her family's home town which was truly a unique experience. Glad to hear you're having a good time and the family is all together! Thank you so much for this blog and for your homepage. It is so nice to see that someone else actually understands what goes through my head, but most of all, what I really like about you is that you have the ability to write about deep archaeological topics in a language that is so exquisite (both English and Swedish)and yet not all full of verbal sh**. Your love of archaeology shows in your work, and I wish other (more famous) authors could express themselves like you do, because your enthusiasm is catching. You go! Oh you sweet things, I am so proud and grateful for your supportive comments! Me & my wife actually caught the Thai water festival on Phuket one Easter a few years back. It`s called Loi Kratong and involves the making of little garish floats the size of a dessert plate; with candles, joss sticks and coins as offerings. You light the candles and incense and set the thing afloat as a sacrifice to undine spirits. Beautiful after sundown. Carnival ambience, fireworks. Kids swim out and nick the coins. A day or two after Loi Kratong we took a nature tour involving elephant riding and a canoe trip on a forest river. And way out in the green wilderness we found a single kratong float lodged among the rushes at the river bank. My brother's experience with Loi Kratong involved sitting in the back of his wife's cousin's pickup truck with giant Super Soaker water gun and attacking other truckloads of people driving by in the opposite direction. No mention of the floats, candles and fireworks but then he's not into that sort of thing. Give him a water gun and someone to shoot at and he's happy. He said it was fantastic. According to some Thais we talked to, they seemed to think of it as a sort of christmas or new year celebration. There were a lot of christmas dekorations - explicitly saying "Merry Christmas" - hanging about the place. As far as I could understand, pouring a little water on somebodys shoulder is the polite thing to do. A sign of respect. They do it to Buddha statues and each other. But in the streets everybody was pouring buckets of water on anybody they could reach. Shop owners attached hoses to their taps and sprayed passers by, trucks filld with barrels of water and people spraying pedestrians with the very same barrels of water. We were soaked to the bone. Luckely, we were well prepared and hade our wallets packed in tripple plastic bags and had only brought waterproof one time use cameras. And to be fair - the shop owners gladly refilled our drinking bottles, so that we ourselves could spray them and everybody else with even more water. It was great fun, maybe with the exception of the talk paste they also wanted to smear on our cheeks, but that in the commotion often was smeared all over our faces and in our moths, but hey - it's a carnival. Few rules apply. It was great fun. Oh Milka! That definately sounds more like the festival my brother talked about. Although the one Martin attended sounds delightful too. I really should go and visit the "family" in Thailand one of these days. I'm such a blonde. My wife informs me that we were in fact on Phuket in December, so that's when we experienced Loi Kratong.